@Marilyn6 - You likely note some skepticism from people like me who use a low carb, high fat way of eating in how it affects blood sugar management. I’ve learned through stories like yours that eating a plant-based high carb, low fat diet can work well for people with diabetes. It has not enticed me to give it a try but I found a first-hand account of someone who has used both diets and compared the two using continuous glucose monitor data. Stephen Richert is an outdoor adventurer and rock climber. In 2015 he compared and reviewed both ways of eating using his CGM as a basis for analysis. Here’s his comparison of blood sugar control performance. Blood sugar control: I feel as though my control was good on both diets with average BG readings around 120-130. The big difference that I noticed was the amount of attention or mental focus demanded by the low-fat, plant-based approach in order to keep a stable line on my CGM. I had to be aware of what direction my blood sugar was trending and the fact that it would rise and fall much more dramatically. Since adopting the Ketogenic diet I have not seen a single up or down arrow on my CGM. No exaggeration. Not one . Rises are slower and less significant (20-30 points)–and so are drops. In terms of my peace of mind, not seeing arrows up or down (which was a daily occurrence on the low-fat, plant-based diet) cuts out a lot of stress and simplifies my life. This account seems credible to me, knowing what I personally do about carbohydrates and my metabolism. I was surprised to learn from this story that the author’s total daly dose of insulin did not vary much from LCHF to HCLF. Now I know that people choose to eat a plant-based diet for many reasons. I like the tone that Stephen has struck in his analysis. I want to preface this comparison by making clear that I am not trying to get anyone to adopt my methods. Optimization of diet is not right for everyone with diabetes at every stage in the game. Parents particularly have to walk a tough line between the desire to optimize for their child and the reality that survival is often the larger priority. Your personal eating experience has opened my eyes to a wider view of diets and diabetes. Before reading your experience and others who eat HCLF plant-based diets, I would have thought that good management of blood sugar would be difficult. Thank-you for that. Thanks for posting this Terry. I would not have changed from Bernstein’s WOE if my LDL would have behaved, and I hadn’t ended up with stents. So much is a mystery though. Even after all the studies and books I have read about LDL, once I ended up with two stents, the info about fat in the diet being bad was and is hard to ignore. I realize that Dr. Bernsteins’s LDL is never less than perfect, and that he doesn’t believe that his WOE changes people’s LDL, but it certainly changed mine. I started following Dr. Bernstein before low carbing became mainstream and people thought I was nuts. Now I am going against the mainstream again. I imagine that in the future the way that I eat will be mainstream for diabetics too. I wish I knew which diet is actually healthier, I definitely don’t know. I just want folks to realize that there are choices other than low carb. I was a vegetarian long before low carbing, and I am more comfortable not eating meat. I sure do miss almond butter though. Actually I also miss bread too. Both of the men who run the Mastering Diabetes website have type 1 diabetes. They are both quite bright. Cyrus Khambatta has an undergraduate degree in mechanical engineering from Stanford and a PhD in Nutritional Biochemistry from Berkeley. One of the reasons I keep mentioning my woe is because I feel so great. I never thought I would enjoy exercise as much as I do. Hi Terry, I have been thinking about this most of the day. The example that you gave about the rock climber made me wonder a bit. I would not be happy with an average reading of 120 to 130, but maybe that average would make it a little easier to flat line. I am just guessing though. I am happy with a lower average reading. I have never tried to keep a flat line and am comfortable with most of my readings being between 65 and no more than 140 two hours after meals. People who don’t have diabetes don’t flat line. I don’t think that low fat vegan diets take more work than low carb diets. I tend to eat around the same amount of carbs everyday for each meal. Unless I get sick, don’t exercise, don’t sleep, or am stressed, I can be fairly sure what my glucose levels will be. On the Bernstein diet my A1c was 4.7 to 5.2. On the low fat plant based diet my A1c’s have been 5.2 to 5.5 or 5.6. I am one of the only members whose A1c has gone up instead of down. Lots of folks were low carbers before, but I doubt that they ate only 30 carbs a day. If my A1c gets any higher, I will not be happy. I would not be happy with an average reading of 120 to 130, but maybe that average would make it a little easier to flat line. I would not be happy aiming for 120-130 mg/dL, either. I target 83 and am happy with results that fall into the 65-120 range. “Flat-line” is a term of art and I don’t interpret it literally. Dr. Ponder says that the only people with flat line BGs are dead! A more descriptive term is reduced glucose variability. Do you use a CGM? I feel best when my variability as calculated by my CGM standard deviation is 20 mg/dL or less. Gluco-normals have a SD of 15 mg/dL. I don’t think that low fat vegan diets take more work than low carb diets. You’re in a better position than me to make this assessment. I’ve never eaten using a vegan diet. I have suspicions about how my glucose metabolism would work eating high carb, but no real world evidence. You have discovered something that works well for you and you feel good. That’s what counts. If my A1c gets any higher, I will not be happy. I think you’re doing a great job of managing your BGs. Unfortunately for me, I’ve found out that I’m a “high-glycator.” That means that my A1c comes in at 0.5% higher than the average BG I experience. The best A1c I’ve ever had is 5.5%. I think I can do a little better than that, but not much. Anyway, I don’t set an A1c goal since I think the more important goals are time-in-range, time low, variability, and glucose average. A1c obscures glucose variability, for example. Thanks for explaining flat lining to me. Now it makes sense. No, I don’t use a CGM. I purchased one several years ago, but have never used it. I have never minded testing and I am fortunate to always wake up if my glucose level drops too much. I function fairly well when in the 40’s. In my 60 yrs I have only needed help a handful of times. I have never been hospitalized because of diabetes since I was dx in 1959. If my husband dies or if he becomes incapacitated before I do, then I will start using a CGM. I do appreciate the fact that it takes a lot of the guess work out of treating our disease. I heard that Dr. Bernstein is now using one, so I may too in the coming years. Never say never. 23 units? U-100? U-500? This doesn’t sound type 1 at all. I say this as my 17 yr old son, type 1, uses about 70 units per day - and 30 units is just basal rate on his pump. I’d love to see what this “eating plan” that you are using now consists of. Can you share? I am type 2, diagnosed a few years after my son got Type 1. I say “got” as I still believe that we acquire this disease when exposed to a similar protein-coated bacteria or virus to the islets, inadvertently triggering the auto-immune response. Perhaps your body is far less affected now, or much more insulin sensitive than others. I often see it as individualized cases, without generic baselines even. Some doctors have said that going super low carb (under 50/day) has helped some people get away from Type 2 diabetes. Most have only short term results though. In the 4 years since being diagnosed as pre-diabetic, I’ve gone from just Glipzide and metformin, rocketing right up to Humulin R, U-500, at 500 units per day. Doctors are now considering if I am both type 1 and 2, or an intermittent type 1. Perhaps you’ve been a multi-type in the past as well. I am now using almost 1/3 less insulin for the past few months, thanks to starting weight watchers, from 500 units of U-500, per day, down to 360 units per day. I heavily increased my fruit intake by 5-10 fold, reduced high-fat foods by about 1/2, but still close to same carbs per day. My “maintain weight” calorie required intake, per physician testing, is 4,000 per day. My targeted weight loss calorie intake, per physicians, is 2,500 per day. In any case, I’d like to improve my health all around, and reducing medicinal needs is always a good thing. Let us all know what a “normal eating day” looks like for you! Bee-Kay, I use U-.100 insulin. I was dx in 1959 and have no working beta cells. I make no insulin. I am 5’1” and weigh 106. I ride my exercise bike 10 miles a day. I am 68. For breakfast I eat 1/4 cooked oat grouts, 1 medjool date, 1 banana, and 2/3’s of a cup of blueberries. A typical lunch is 1/2 of a large squash, 1 cup of black beans, 1 date, kale and nutrictional yeast topped with pumpkin kernels. 2 garbanzo bean chocolate chip cookies. Dinner tonight is a lentil, black bean, sweet potato, pumpkin kernels, spinach stew, 1 low fat mini naan, 2 garbanzo bean cookies. When low I will eat a date or two or an apple. The trick to this way of eating is that it is very low fat. See Mastering Diabetes for more info. Many type 2 diabetics are able to stop taking all diabetic meds if they eat this way. Also exercise is a big part of this lifestyle. My insulin sensitivity has increased almost 10 times to what it was when I was eating 30 carbs a day. It sounds like simple fat reduction improves insulin sensitivity overall, which would also explain my lowered dependency on insulin. Interesting that people often go low when eating foods which contain high fat, so it must be blocking absorption of sugars, versus increasing insulin performance. Of course, I also don’t bike 10 miles a day, which may make a slight difference in insulin sensitivity too. LOL. Interesting that people often go low when eating foods which contain high fat, so it must be blocking absorption of sugars, versus increasing insulin performance. "Fat in the bloodstream can build up inside the muscle cell and create toxic fatty breakdown products and free radicals that can block the insulin signaling process. When that happens, no matter how much insulin we have in our blood, it won’t be able to open the glucose gates. That causes blood sugar levels to build up in the blood. This mechanism by which fat induces insulin resistance wasn’t known until modern MRI techniques were developed to see what was happening inside people’s muscles as fat was infused into their bloodstreams. The scans showed researchers that higher fat levels in the blood caused insulin resistance by interfering with glucose transport into the muscles. This can happen within three hours. One hit of fat can start causing insulin resistance, inhibiting glucose uptake after just 160 minutes. You can also do the opposite experiment. Lower the level of fat in people’s blood and the insulin resistance comes right down. By clearing the fat out of the blood, you also clear the sugar out of the blood. On the high-fat, ketogenic diet, insulin doesn’t work as well. Our bodies are insulin resistant. But as the amount of fat in our diet gets lower and lower, insulin works better and better. 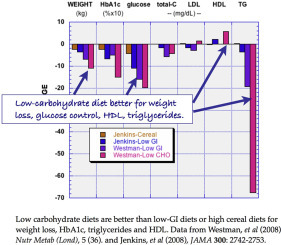 This is a clear demonstration that the sugar tolerance of even healthy individuals can be impaired by administering a low-carb, high-fat diet. We can decrease insulin resistance by decreasing fat intake." Do you mean what “Forkes over knives” write? @Siri - Thanks for providing this link. I read through it but it describes a complex process with many biochemistry terms. I’ve never been formally schooled in biochemistry but I’m thinking that it would be beneficial to better understanding the role of nutrition and metabolic disease. I did, however, take interest in this paragraph because I’ve seen elsewhere the assertion that all macronutrients are inflammatory. I acknowledge @jack16’s point that dietary carbohydrates can lead to excess circulating fats created in the liver. I also conclude that the complexity of this whole issue is well beyond my grasp of the science. In the meantime, however, as people with a fundamental metabolic disorder, we must make our best guess as to what style of eating is best for us. Even people conversant in all the biochemistry are not in agreement as to the best nutritional intake. So, we’re basically left to our own devices and judgments based on an incomplete understanding of the system. I think there will continue to be tension within this community between the low-carb, high-fat adherents and the plant-based forks-over-knives constituents. I think we’ll all be best served by providing comments that shed more light on the issue while trying to tamp down the amount of heat. My triglycerides were about 45-56 during my 11 yrs on 30 carbs and less than 60 during my 2 1/2 yrs eating close to 300 healthy plant based carbs. I am seeing very little difference. I need a unit more insulin. Also, the young man with type 1 who runs. Mastering Diabetes has a PhD in nutritional biochemistry from Berkeley. Cyrus eats 750 carbs daily and takes 23 units of insulin. I think he has been a type for 15 yrs. He is also extremely fit. I am wondering what kind of automated insulin delivery system you have. I use Loop, an Apple-based do-it-yourself system. Insulet, the Omnipod manufacturer, is developing a closed-loop system called Horizon. Separately, Tidepool is working on producing an algorithm based on Loop that it intends to seek FDA approval. Insulet has committed to Tidepool to integrate Tidepool Loop with an Omnipod pump system. Delivery of these systems is likely to happen in the 1-2 year time frame. What you are doing is working for you. Your metabolism is only using 23U total on a 300g carb diet. I don’t know what percent on T1s this would work for. I would guess like the average population about one third can handle carbs. I assume you are also in the healthy weight range, perhaps tending towards the lower end. It is only a minor rise, I half expected you to say your trigs were lower. In studies a small percent actually have a rise in trigs on low carb. Dr. Volek, is one of the doctors whose work I read that led me not to worry about my climbing LDL numbers while on the Bernstein diet. My trigs were super low, my HDL was 90 to 100 and my LDL climbed to over 200. I ignored the LDL and I ended up with heart stents. Another lovely man who was a fan of Dr Bernstein’s lost around 100 lbs before he had a stroke and a heart attack on the same day and died. I have no idea if my stents and his death were caused by extreme low carbing. I kept low carbing for several years after the stents and my LDL stayed around 140. I never thought a very low fat vegan diet would work for me, but I was gaining weight after 11 years of low carbing and I am not a fan of meat. I heard of The Mastering Diabetes program and decided to switch eating plans with the help of the two guys with type 1 who started the site. I lost 10 lbs very quickly and a few more after that. I am fairly tiny at 5’1” and 106 lbs. It feels just right. My husband is doing well eating low fat plant based too. He has never been thinner. He is 69 and I am 68 and we both walk and spend lots of time at the gym. I have never felt better in my entire life. I am not saying that one woe is better than the other. I would love to know eventually if one plan is better. I do know that there are lots of folks with type 1 and type 2 who are thrilled to be eating this way. Large numbers of folks are very skeptical when they start eating this way, until they see their A1c numbers drop. My A1c actually rose a bit because I had been very faithful about eating 30 carbs a day. My insulin sensitivity has risen to 10 times what it was low carbing. I was skeptical and still am skeptical, but man, I feel great. It’s been your observation, but may not be the cause. Heart disease doesn’t happen in the few years you were low carb. It’s more probably that it occurred over your long life before low carb. Or you would have children falling over or a raise stats among those on low carb, It isn’t the case. The trigs and HDL ratio is considered the markers for vascular disease now. There are A and B LDL, B is bad.